In the past weeks I have been literally knitting my fingers to the bone trying to complete as many pussyhats as possible for the marchers in the Women’s March on Washington on 21 January. Last weekend I had to go out and buy more yarn. Pink yarn is getting hard to find. Word has spread about this project and it seems that everyone who can lift a needle is making pink hats. I still have to make labels, photograph them and get them in the mail. Somewhere in deep stash I found two more skeins of pale pink yarn. All over the country messages are coming in on Ravelry, requests for more hats to warm more heads who have a seat on one of the buses going to DC. I am living vicariously through all the anticipation. I won’t be there, so it’s especially important that I do my bit to support the sisterhood. Various shades of pink yarn waiting to be knit into hats. The first batch of hats ready to mail to cousin Melanie. As for the other parts of my life, they have been put on hold. I take small breaks to check my email and to read reports that I have to comment on or questions I have to answer. I check with doctor’s offices and talk to my mother, and gather tax documents. 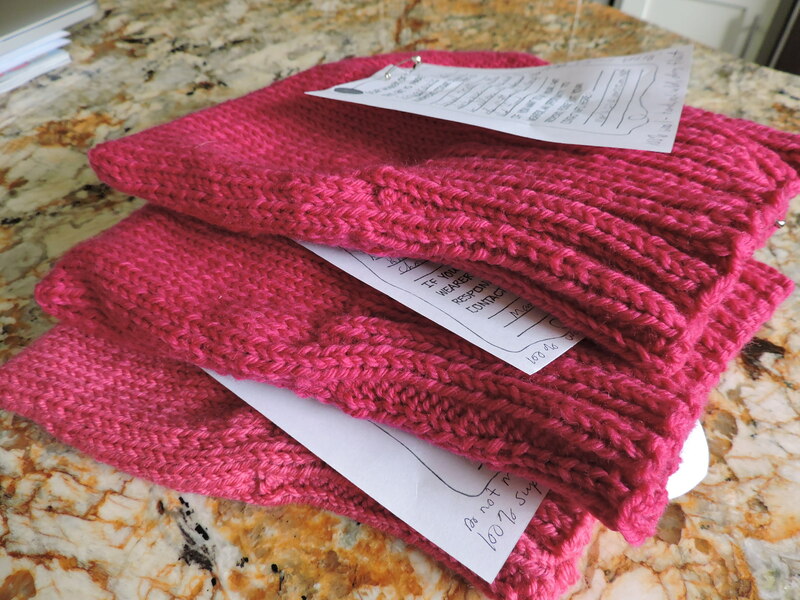 But these are all distractions from the main work at hand: to knit and sew and label and register a few dozen pink hats that have to get in the mail by this weekend. I pray I don’t get carpal tunnel syndrome or arthritis in my fingers, or even a sprain. I’m up to 21 hats now, with more to go. I will have knit the equivalent of over 3500 yards of yarn, or enough for two sweaters in just over a month. One skein of precious Malabrigo kettle dyed yarn remains at the bottom of my bag. That’s for my hat, which I’ll get to after the 21st of January. My single pussyhat to remind me of my journey to activism that started with door knocking and led to hat knitting, and where it will end . . . is still to be discovered. You will have earned that pussyhat for sure, lady! Thanks for telling me about your blog.I enjoyed reading your posts! Keep writing; you’re a natural storyteller and I admire your dedication to important issues. Thank you Judy. So glad you are enjoying my blog. I love feedback!